The end of the cold war was thought to signal the triumph of Western capitalism over Communism. 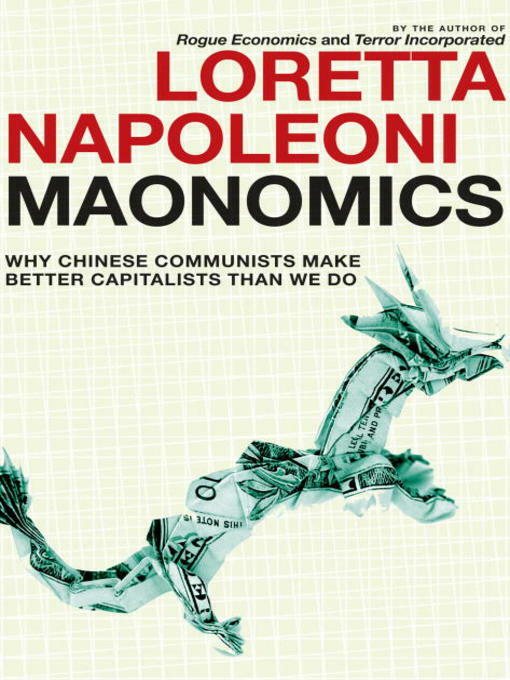 In Maonomics: Why Chinese Communists Make Better Capitalists than We Do, Napoleoni argues just the opposite: what we are witnessing instead is the beginning of the collapse of capitalism and the victory of "communism with a profit motive." Maonomics charts the prodigious ascent of the Chinese economic miracle and the parallel course of the West's ongoing insistence on misconstruing China and its economy even as we acknowledge its growing influence and importance. Maonomics is a warning call whereby Western governments can avoid economic collapse by learning how to understand more clearly what the lessons of the Chinese economy really are. Based on first-hand reporting from China during frequent visits in the last several years, Maonomics lends credence to the Chinese view and translates it for Western readers. For example, the Chinese too are attached to their vision of democracy, but it is different from ours. It isn't focused as much on voting as it is economic opportunity and the fair distribution of wealth and prosperity. Napoleoni also separates failed Leninist political ideology from true Marxist theory, showing that Marx's writings do not reject profit so long as it is used to benefit the people. Marx's dictatorship of the proletariat is being realized in China, she argues, where giant steps forward are being made in the name of progress and the wellbeing and prosperity of the Chinese people. Looking at the Chinese economy up close, any economist would be hard pressed to say that they are not on the right track. Here Loretta Napoleoni offers a front row seat on the greatest show on earth: the peaceful economic revolution that is shifting the balance of power in the world from West to East.